This traditional Holy Family contains Joseph, Mary, and baby Jesus. The figures are forged from valuable copper. Baby Jesus’s bed is yellow bronze. Joseph measures 5 inches tall to the top of his staff. 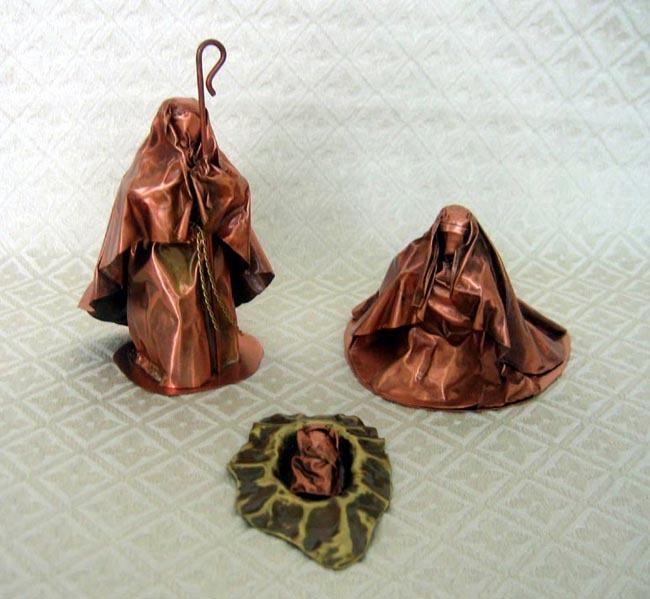 The Nativity is signed by master coppersmith artist Jorge Monares of Santiago, Chile. He learned the copper trade working in his father’s workshop beginning in 1976. Jorge currently works with his wife to create decorative pieces like Nativities, angels, and jewelry, plus utilitarian pieces like pots, bells, and candle holders. His unique designs stem from many years developing a self-taught form. Jorge also enjoys the craft of colonial forging: using only fire and hammer as his fundamental tool. The Atacama Desert in the northern part of Chile hosts important mineral deposits including copper, which is Chile’s main export. In fact, Chile is the copper-mining capital of the world, producing over one-third of the global copper output.